The lifts designed in compliance with the CABIFIT-DF model are characterised by the gearbox placed in a side wall of the shaft, protected outside by a key-locked door cover. The control panel, main supply and light switches, etc. are placed inside a portal in a landing door. The strong points are the same as those already described for the CABIFIT model. However, CABIFIT-DF does not need space for the CABIFIT cabinet at the side of the shaft wall, but the minimum shaft width shall be about 50 mm larger and the shaft wall thickness shall be at least 200 mm. The dimensions of the cabinet containing the control panel, main supply and light switches, and the dimensions of the hole in the shaft wall where the gearbox frame is placed, are always the same, regardless of the installation features. 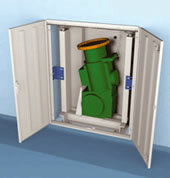 Both gearbox and cabinet can be placed at any landing. Maintenance and rescue operations are operated once the cabinet is opened. The machine maintenance operations do not require access to the inside of the shaft and there are several benefits for the installer and maintenance operators. The assembly is easier because it is nearly the same as a traditional lift with the machine room, the gearbox is fixed at the floor and rests on a frame, therefore its position is extremely stable and maintenance operations can be carried out on the ground. The rescue operations can be carried out by any trained person and these are always possible in any fault situation.